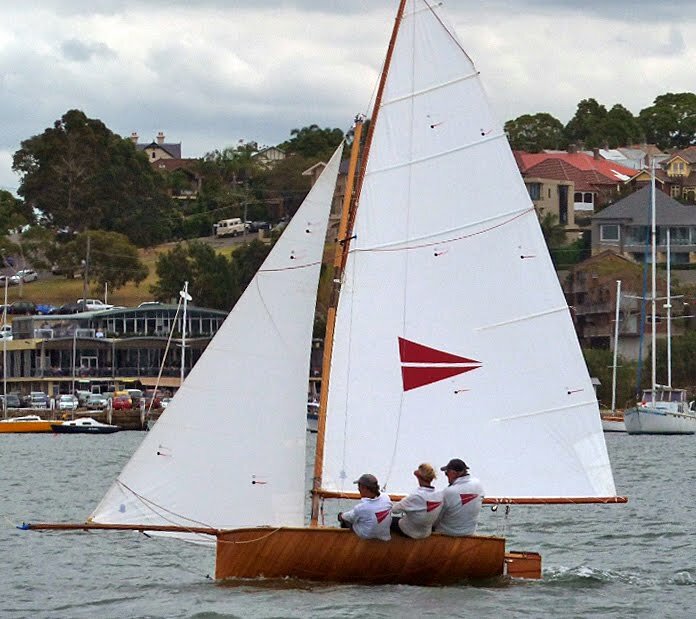 Australian Classic 10 Foot Skiffs; What about the other view? 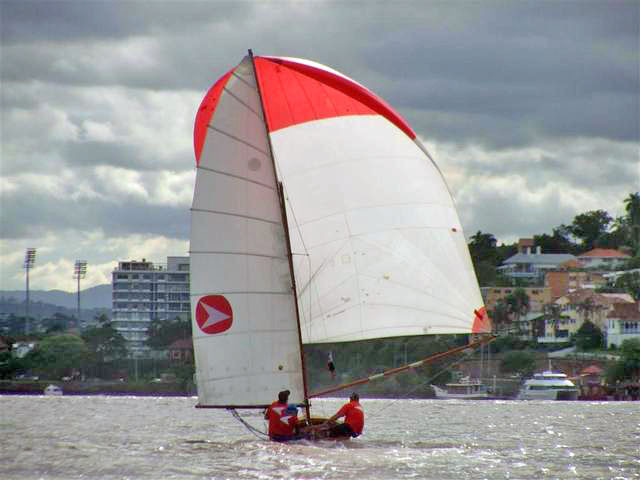 Pete from the New South Wales 10 footer fleet emailed to say that he noticed that I only posted photos of the 10 footers going upwind. 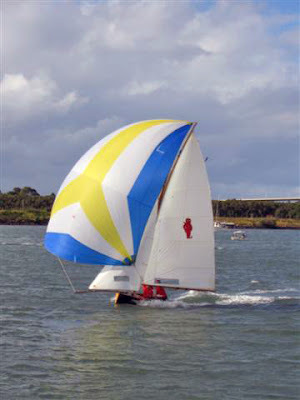 To rectify my omission, he supplied some photos of the 10 footers running offwind with their (ahem!) 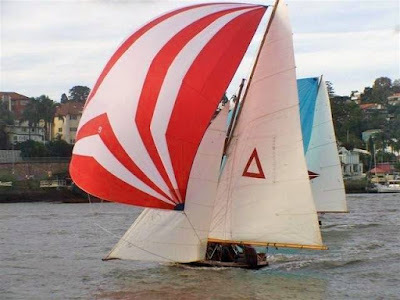 normal day-to-day spinnakers. My posts on beer now go back into the Internet dark ages (at least 6 months ago). What drags me back to posting about beer? Tis the season, the season of the true, blue American pumpkin beer. (I can almost hear my international readers say "Ewww!"). I've made it my mission this year to taste as many pumpkin beer varieties as possible, mainly so that Ed and Mike and John and I can pontificate about beer tasting when we have no clue about what a true beer connoisseur should say (Mike brought a beer to the Classic Moth midwinters that he said tasted like PEZ (a hard candy with tart bite that most often is dispensed in an odd container; have to say I agreed with him). Too hoppy. Again overpowers the pumpkin. Golden color. Almost perfect blend of pumpkin and spice flavors. As you would expect from the wheat base, a lighter beer with a fizzy head but the pumpkin taste doesn't take second fiddle. Very tasty. I can taste the pumpkin, I can taste the beer; however I can't taste the connection between the two. The bottle mentions spices, maybe.... but not enough for my palette to pick them up. Update: Had this in combo with some spicy food and it complimented it nicely. This porter pours fizzy and the carbonation remains strong in the first taste, obscuring any flavor. The stout overpowers the pumpkin here, so much so that I can't really identify the pumpkin. Flying Dog Ales Imperial Pumpkin Ale "The Fear"
Can taste the pumpkin in this one but, for my taste buds, this ale just didn't stand out. Barbara Parsons from up Philly way had me sample this. The initial carbonation was a problem but if you let the beer air out for a while it changes everything. Pumpkin taste definitely there with spices, I detected a strong vanilla tone. Top notch especially if you let the beer sit for a while after opening. This beer has a strong reputation among pumpkin aficionados. I had one that was just transported down from Maine. 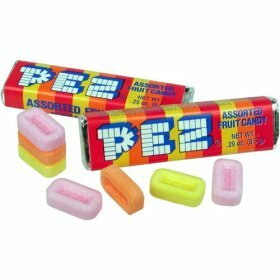 Very tasty but I can't remember anything else about it. Tastes vary widely on music and beer. So, swill down a pumpkin beer and post a comment. I'm waiting for Ed to weigh in with his choices and I'm hoping to cajole some tastings from Mike as well. This year has been a bust for my Classic Moth racing. 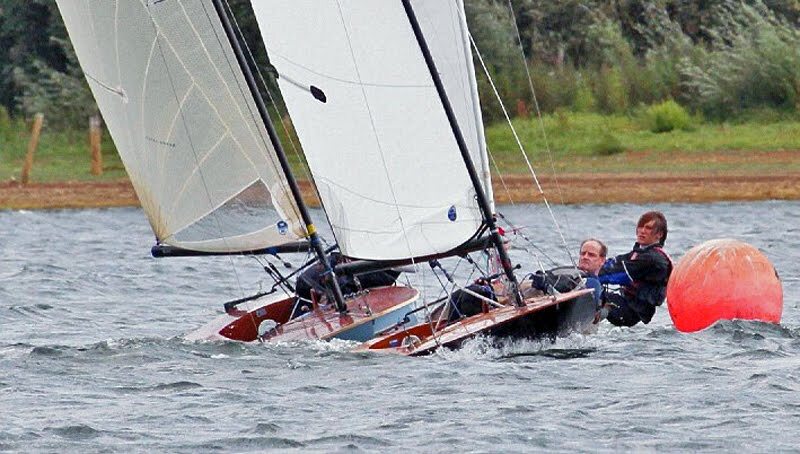 I've raced two regattas this year but a wedding and then subsequent entertaining of out-of-town relatives meant I missed this years Classic Moth National Championships in mid-September. Luckily 'Earwigoagin' correspondent Len Parker was on hand to file the following report and photos. Nationals 2011 as seen through my novice eyes ... Weather forecasts for the weekend were 20-30mph winds with on & off rain. Not knowing the Elizabeth City topography very well , I guess those forecasts were for further east as it was 10-15 on Saturday with some heavy showers , and slightly less wind on Sunday with some gusts keeping everyone busy and putting several down. The wind did pipe up even more both days after the racing had ended. 13 signed up to race. Gen 1 ... George Albaugh , Walt Collins , Greg Duncan , Lewis Hay , Bill Schill , John Pugh , Joe Courtier. Gen 2 ... Jeff Linton , John Z , Mike Parsons , Mark Saunders , Randall Swan , Patrick Burger. 5 races Saturday... Jeff won all 5. In the first or second race Bill Schill lost his mast and we had to tow him in. As we were sorting it out Patrick also lost his mast , so we had to tow both in together. Greg came in a race or so later & Patrick used Greg's extended-mast Europe for the rest of the day. 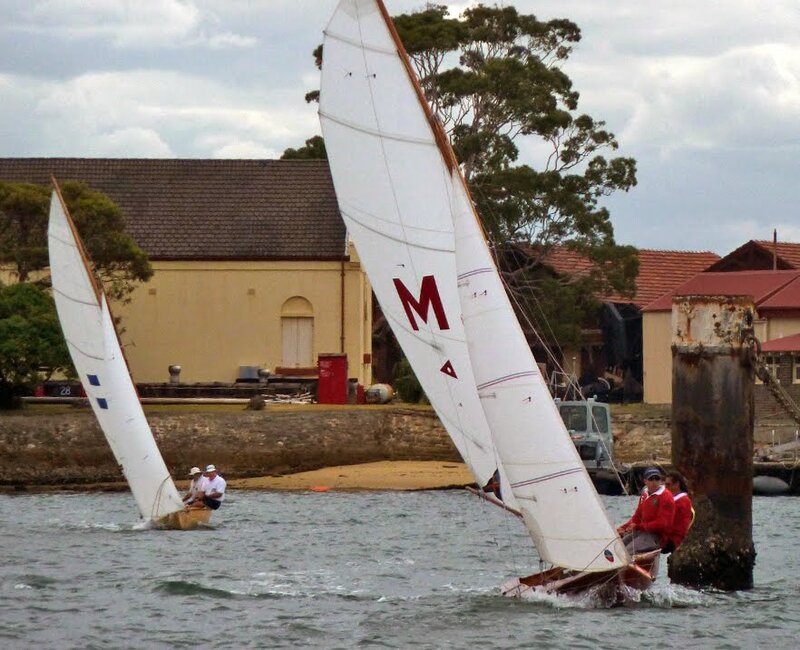 Mark then snapped a shroud and lost his mast in race 5. Sarah & John Pugh's hospitality was superb as usual , with food , drink , and a roaring fire going to get people dry and warm before the caterers arrived. The annual meeting was also held Saturday and the sail proposals were passed ... and all the officers remain in their respective posts. 4 races on Sunday... Jeff won 2 races , as did Mike. Lewis ... Randall & Greg didn't race. 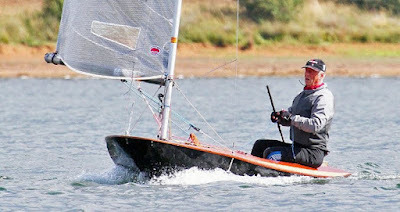 Patrick back in his new boat retired in race 1 after shipping too much water. He plans to widen those side tanks. Mark came in early after being over the start line early a couple of times. Lewis Hay bought Randall Swan's Skol. John Pugh bought Lewis Hay's Europe. It was a fun weekend , the racing weather was good , the spectating weather was awful on Saturday and I was wearing every item of clothing I'd bought with me and it was all soaked but it was still fun. Everyone got away at a decent time after the prize giving due to the meeting being held the day before. Len also sent along some photos. Walt Collins leads Jeff Linton around the leeward mark. Mark Saunders, Mike Parsons, John Z aiming for the leeward mark. Mike Parsons, John Z on the second reach into the leeward mark. Jeff Linton rounding the leeward mark. Joe Courter in his Maser. 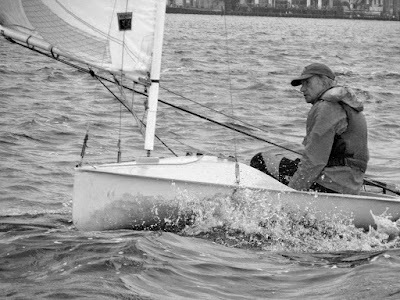 George Albaugh, the same George from the photos above, has two posts on the 2011 Classic Moth Nationals; one on the racing with pictures and the other on the people around the Pugh's backyard. 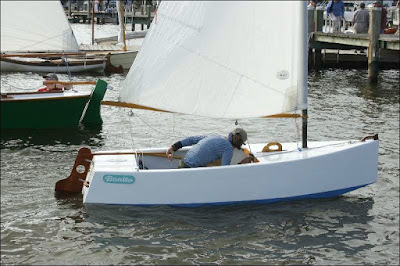 Meanwhile, Joe Bousquet, who also missed the Nationals for a family reunion, posted this GoPro video up on YouTube of him sailing his Mistral Classic Moth at Silver Beach on the Delmarva Peninsula. (Was he allowed to take his Classic Moth to the family reunion? Lucky dog!). The new deck Joe installed on his Mistral looks very curvaceous and varnish-pretty in this wide angle view. You may also hear how these plywood Moths have a very different "Boing" sound when going through waves (compared to those unnamed plastic classes). I get a kick out of this class. 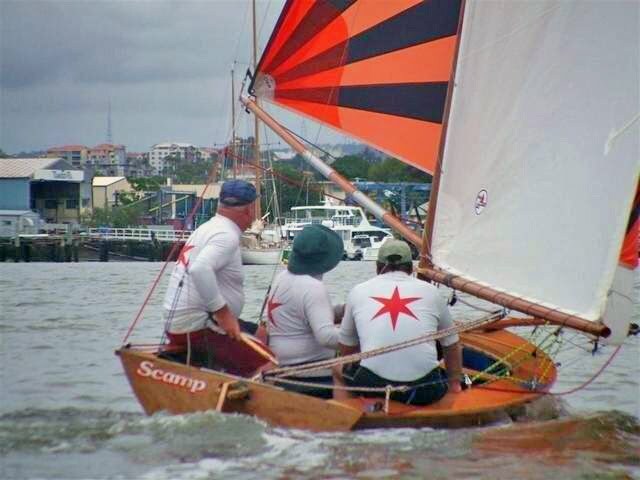 How they shoehorn three grown adults into a ten footer and then pile on scads of sail is my kind of crazy. Plus, class rules stipulate that all boats must be clear finished. I've posted before on this class (search over at this link ). From the class website, looks like they're launching two new hulls for their season so they must be attracting even more crazies. I've found more photos off the Internet (click on photo to enlarge). Picture looks to be early 60's; pre-trapeze. Location Annapolis; Frostbite sailing. Skipper and crew unknown. Male and female teams were very common in the 1960's (hard to tell from the photo if this is a mixed crew). I pulled reader "Doc Haagen-Dazs" from the comments and enjoyed reading where he relates his time in a Classic International 14 over here. Great story. Music Whenever; Club 8 "Everything Goes"
When I was a senior in high school, my father moved the family to Youngstown, Ohio and I was introduced to Midwest lake sailing. We joined the Berlin Yacht Club , a small yacht club on Lake Berlin about twenty miles west of the city. 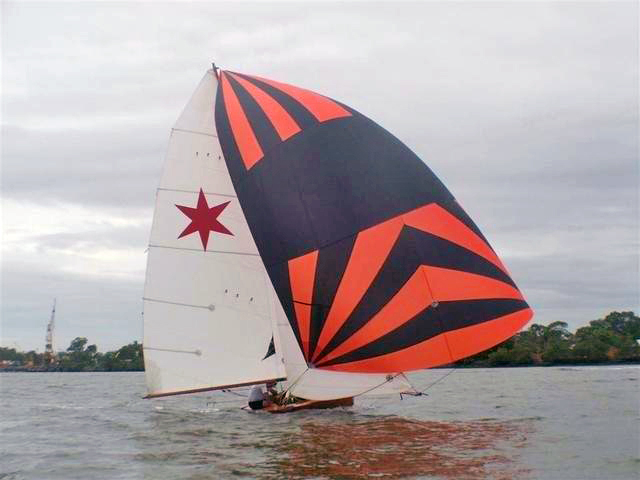 We brought our Windmill out from Maryland and raced with the handicap fleet for a year or two before my Dad decided to buy a slightly decrepit Y-flyer and join the Y-flyer fleet. 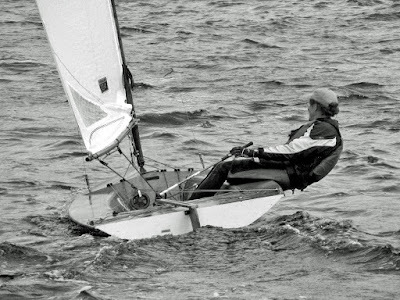 Club racing was usually two races on Sunday with a break for lunch and then a barbecue after the last race. Everyone started at the same time, on a line that extended from the club dock, and then we usually raced a circular course around permanent marks placed on the periphery of the lake. Depending on the wind, we would start going west or we would start going east. We might get a true beat, and then again we might not. 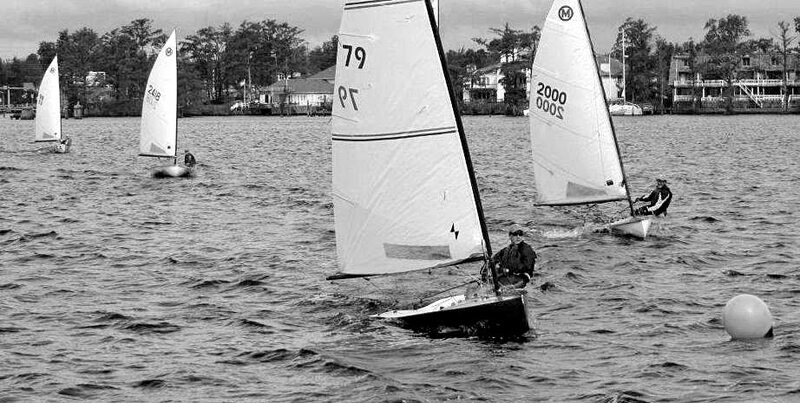 To say this was a culture shock would be an understatement, as even back then, my sailboat racing in Maryland featured separate fleet racing around triangle courses with the first beat to windward. And then there was lake sailing where the wind was most times light to nonexistent and puffing from over there, oops.... now it's behind us, or now it seems to be wafting from above. 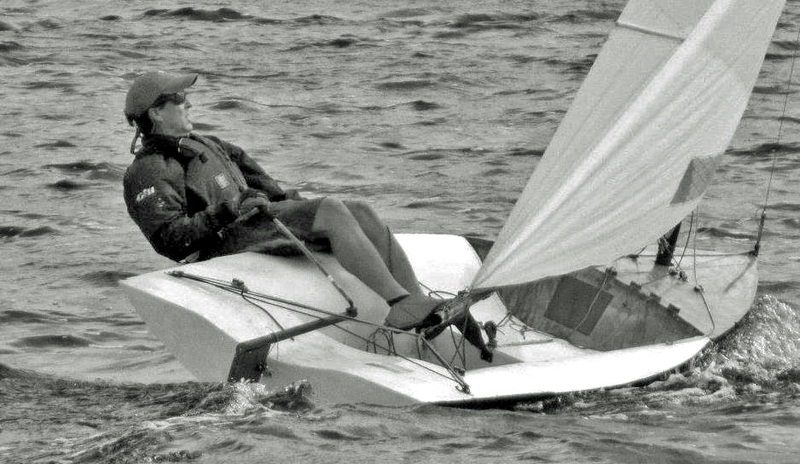 As frustrating as it seemed at the time, I have fond memories of racing a Y-flyer on Lake Berlin. 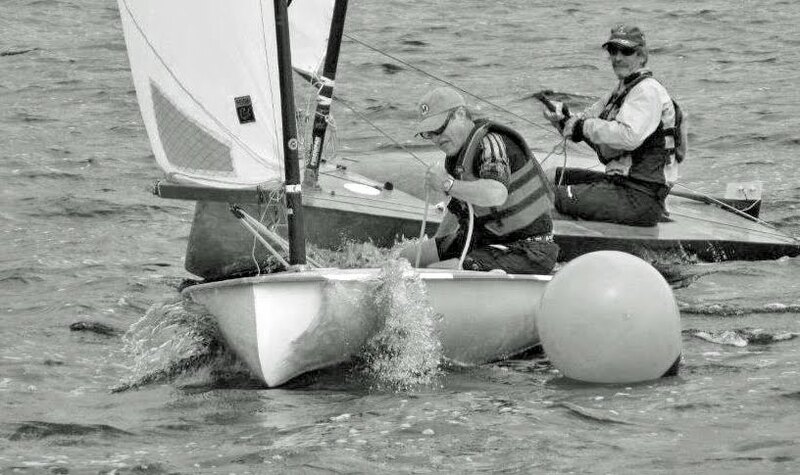 There is just something about the Midwest sailboat racing that ratchets down the competitive buzz you get out on the coasts. The racing was fun, ludicrous at times but it made you humble; the people are genuine. 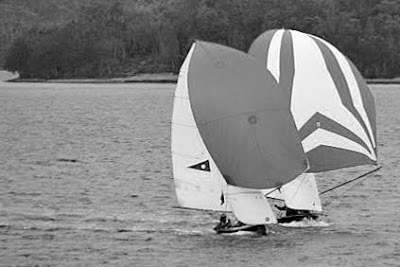 Probably no YouTube video out there epitomizes my Y-flyer racing on Lake Berlin than the following video about "Tim the Sailor". Light air degrades into drifting, then upgrades into light air, then degrades into drifting. 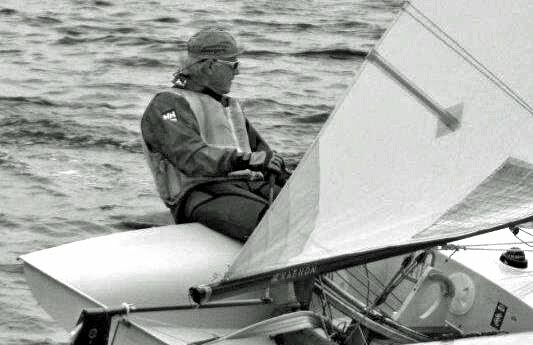 There is the mass start where Tim starts next to a Thistle (never, never start next to a Thistle in light air, there are few boats anywhere in the world that can stay with a Thistle in the light to drifter). There is the parking lot, the inevitable bunch up where all fleets are mixed together. And there is that smile, when upon finishing, golly-gee-whiz, you have actually beaten a Thistle. 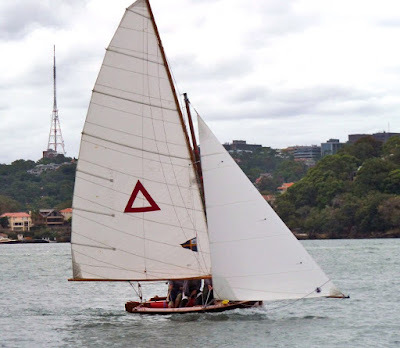 I've posted before on the British Moth , a class that formed in 1932, with their own version of what, in that day and age, pre-WWII, was the latest Moth design, but what we today consider a vintage style Moth, a scow bow Moth with V sections designed by Englishman Sydney Cheverton. It remains a viable class in 2011, the high aspect rig fully modernized with a fair number of skippers flying aramid sailcloth on carbon fiber rigs. The class also retain the Circle M insignia, just as the USA Classic Moths. Although we share the 11 foot length, the two classes have a different ethos. We remain brother in arms, albeit on different sides of the Atlantic.